The second annual IPAAFF is on! 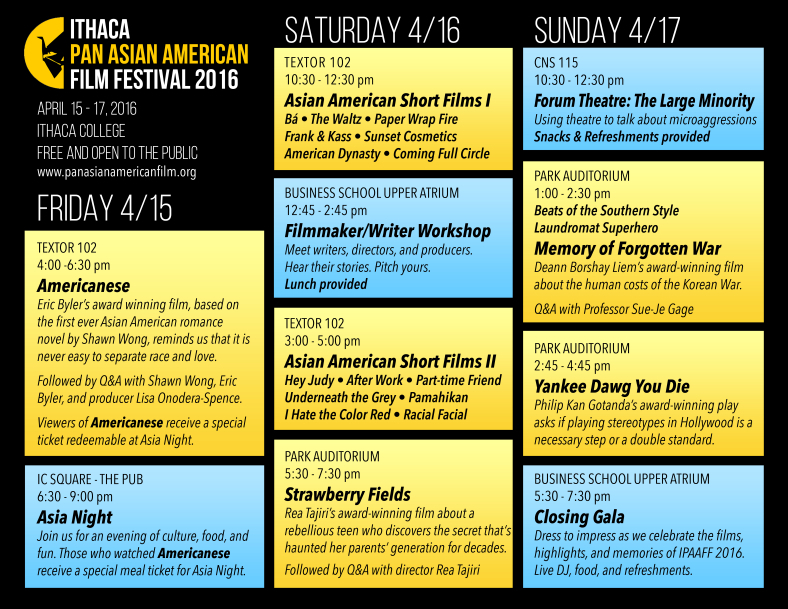 The second annual IPAAFF will take place April 15–17 at Ithaca College. Students and faculty have worked together to create a weekend filled with films and discussions along with writing and theater workshops that will help people to understand and recognize the stereotyping and culture of Asian-Americans. The first day of the festival will have a featured film followed by a dinner; the second, a set of short films, a writing workshop, more short films and then a featured film; the third, a theater piece, followed by two films and a gala in the evening to celebrate the event. What If Hillary Was An Asian American Woman?